Possibly the most well-known reason that captions are used are for those who are deaf or hard of hearing. According to the 2016 National Health Interview Survey, nearly 38 million people have some level of hearing loss. Captioning makes content accessible for entertainment and emergency purposes. Studies show that reading comprehension and literacy rates increase in students when they view content with captions. For approximately 4.5 million students in the U.S., English is not their first language. Captions are shown to increase their understanding of key concepts and improve the mastery of a new language. Captions are often invaluable to those who are deaf or hard of hearing, but they are also extremely useful in situations where TV’s are inaudible, such as in a bar or restaurant. Captions allow everyone to stay informed and entertained. With the increase of mobile device users, more media is being consumed now than ever before. Captions let users understand video content at any time, especially in public when having the audio on is not an option. Search engine optimization is the most effective way that traffic is driven to your website, and captions can help. Transcripts of audio develop keywords for your website and text files, like captions, are indexed by Youtube and Google. This enhances the search engines web crawling abilities and increases your web presence. 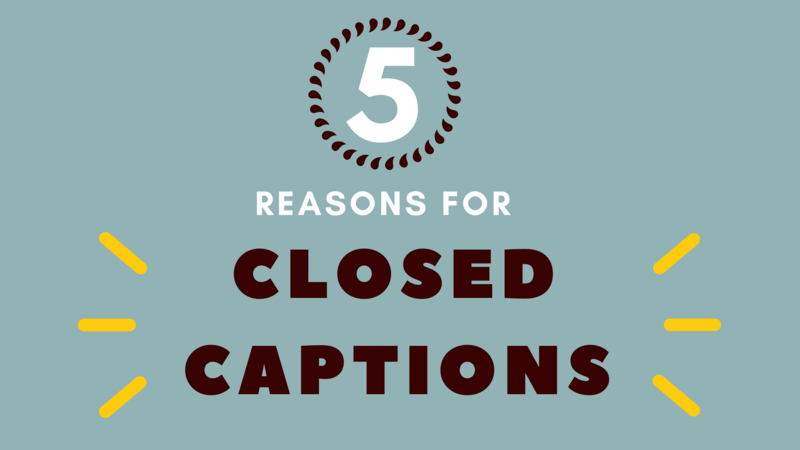 No matter the reason, closed captions are required by law in many cases. Let our Automatic Caption Solutions help bring your content into the 21st Century.